Okay I’m talking up a big game. And I’ll get to that in a second. But first, we don’t eat a ton of bananas in this house. Lila likes them as much as me, which is probably a “normal” amount, but Ethan associates them with a yucky morning tummy (too many carsick experiences with bananas). So now when I buy them, I buy about 3 to eat and 3-5 to bake with. That’s because I love baking with bananas. I love banana bread, muffins, frozen chunks for smoothies or a quick blender “ice cream” - add a bit of milk then walnuts and dark chocolate at the end and you have a homemade, way cheaper chunky monkey (sorry Ben and Jerry’s!). Plus, I feel like kids totally love anything baked with bananas. And Lila confirmed that these are no different. She LOVES when I bake these up. Total kid win. Okay back to why this is the only banana nut muffin recipe you’ll ever need. Well for starters, this recipe gives you a totally classic muffin texture. I find muffin texture hard to nail - sometimes you’re eating a “loaf”, sometimes a cake, and sometimes it’s just too dry. Muffins, IMO, are meant to have a bit more of a crumble and a slightly more earthy than sweet taste. Kind of like the difference in texture from a scone and a biscuit! Anyway, my muffin attempts always tend to be too sweet or cake-like. This one nails it, I promise. If you are nut-free, a great substitution would be chocolate chips! I wouldn’t worry about it becoming too dessert like, this recipe can handle it, I do add a little brown sugar on the top after all! I’d probably go dark chocolate, and chop them into small pieces, or use a mini chip. Honestly just eyeball it, but probably 1:1 sub for the nuts. As far as nuts. I recipe tested this guy with walnuts and pecans. Walnuts were FAR too heavy for this recipe. Pecans chop down nicely, add a subtle flavor and a delicate crunch. I wouldn’t deviate from pecans if you can help it (unless you’re going the chocolate-chip route!). I use a bit of whole wheat flour in this recipe. If you don’t have it and can’t justify buying it, going ahead and add the amount in AP flour instead. 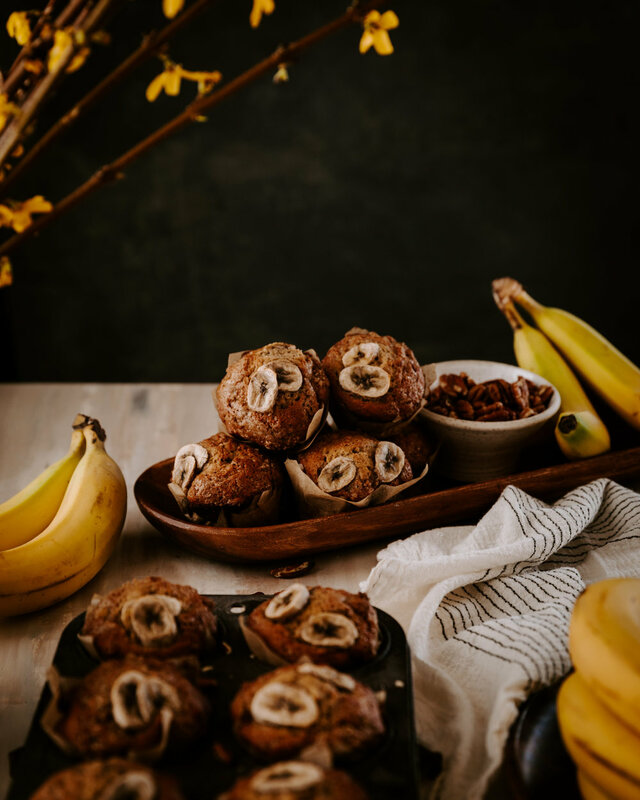 I really like the way WW flour holds up to banana baked goods, but I get not wanting yet another ingredient you may rarely use in your pantry! Additionally, a note on the banana slice garnish. It’s borderline “Pinterest Fail”. If you want the garnish maybe do just one. Two is far too heavy and will slip out of place as it rises. Additionally, it didn’t store as well. The moisture from the bananas created an environment where mold grew much quicker than when I didn't garnish with them. If you’re debating the sugar topping, I’ll just make the case for the crunchy muffin top it creates. Without it you’ll have a much more classic soft muffin top texture which is totally fine and delicious, however the slightly crispier top was sooooo good. Enjoy this one my friends! 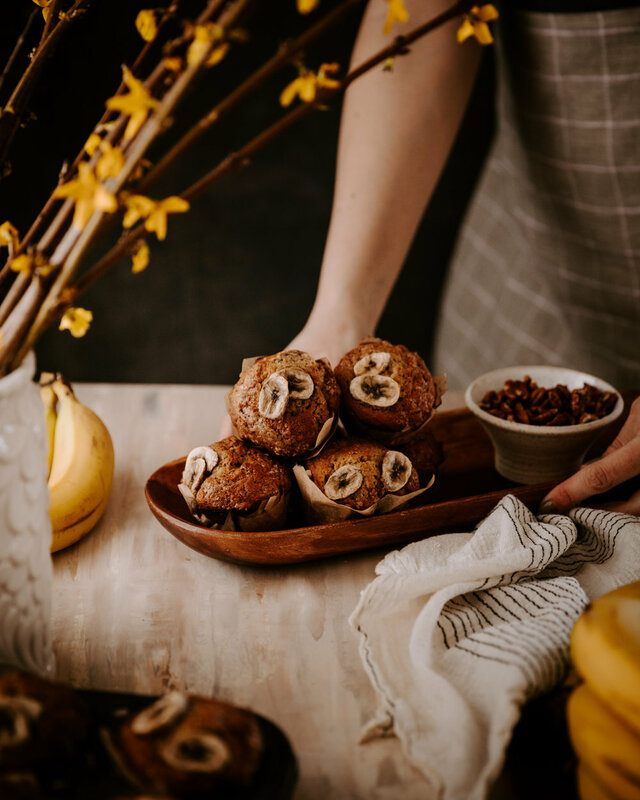 This yummy banana nut muffin recipe is the perfect muffin consistency. Easily sub nuts for chocolate chips! Preheat oven to 350 and line a muffin tin and set it aside. In a medium bowl, mix together dry ingredients. Set aside. Using the wire whisk attachment for your standing mixer, mix 2 bananas with the brown sugar on high speed for 2 minutes. Pour in melted butter as it mixes for another minute. Reduce speed to medium and add eggs and vanilla. Mix until incorporated. Add the remaining bananas, using your hands to break apart into small chunks. Mix on a slow speed to incorporate. Add dry mixture and scrape bowl. Use a medium low speed to incorporate until a batter is formed then add the chopped nuts. If your muffin tin is a standard cupcake depth, fill muffins close to the top to get a nice muffin top. Sprinkle brown sugar on top of batter. Bake 12-15 minutes until the centers are fully cooked.